1. Group NHW, Peterson J, Garges S, Giovanni M, McInnes P, Wang L, Schloss JA, Bonazzi V, McEwen JE, Wetterstrand KA et al: The NIH Human Microbiome Project. Genome Res 2009, 19(12):2317-2323. 2. Vijay-Kumar M, Aitken JD, Carvalho FA, Cullender TC, Mwangi S, Srinivasan S, Sitaraman SV, Knight R, Ley RE, Gewirtz AT: Metabolic syndrome and altered gut microbiota in mice lacking Toll-like receptor 5. Science 2010, 328(5975):228-231. 3. Forsythe P, Kunze WA, Bienenstock J: On communication between gut microbes and the brain. Curr Opin Gastroenterol 2012, 28(6):557-562. 4. Foster JA: Gut feelings: bacteria and the brain. Cerebrum 2013, 2013:9. 5. Gonzalez A, Stombaugh J, Lozupone C, Turnbaugh PJ, Gordon JI, Knight R: The mind-body-microbial continuum. Dialogues in clinical neuroscience 2011, 13(1):55-62. 6. Foster JA, McVey Neufeld KA: Gut-brain axis: how the microbiome influences anxiety and depression. Trends Neurosci 2013, 36(5):305-312. 7. Bhattacharjee S, Lukiw WJ: Alzheimer's disease and the microbiome. Front Cell Neurosci 2013, 7:153. 8. Cryan JF, Dinan TG: Mind-altering microorganisms: the impact of the gut microbiota on brain and behaviour. Nat Rev Neurosci 2012, 13(10):701-712. 9. Montiel-Castro AJ, Gonzalez-Cervantes RM, Bravo-Ruiseco G, Pacheco-Lopez G: The microbiota-gut-brain axis: neurobehavioral correlates, health and sociality. Front Integr Neurosci 2013, 7:70. 10. Diaz Heijtz R, Wang S, Anuar F, Qian Y, Bjorkholm B, Samuelsson A, Hibberd ML, Forssberg H, Pettersson S: Normal gut microbiota modulates brain development and behavior. Proc Natl Acad Sci U S A 2011, 108(7):3047-3052. 11. Collins SM, Kassam Z, Bercik P: The adoptive transfer of behavioral phenotype via the intestinal microbiota: experimental evidence and clinical implications. Curr Opin Microbiol 2013, 16(3):240-245. 12. Lyte M: Microbial endocrinology in the microbiome-gut-brain axis: how bacterial production and utilization of neurochemicals influence behavior. PLoS Pathog 2013, 9(11):e1003726. 13. Bravo JA, Forsythe P, Chew MV, Escaravage E, Savignac HM, Dinan TG, Bienenstock J, Cryan JF: Ingestion of Lactobacillus strain regulates emotional behavior and central GABA receptor expression in a mouse via the vagus nerve. Proc Natl Acad Sci U S A 2011, 108(38):16050-16055. 14. Andersen S, Hughes D: Host specificity of parasite manipulation: Zombie ant death location in Thailand vs. Brazil. Commun Integr Biol 2012, 5(2):163-165. 15. 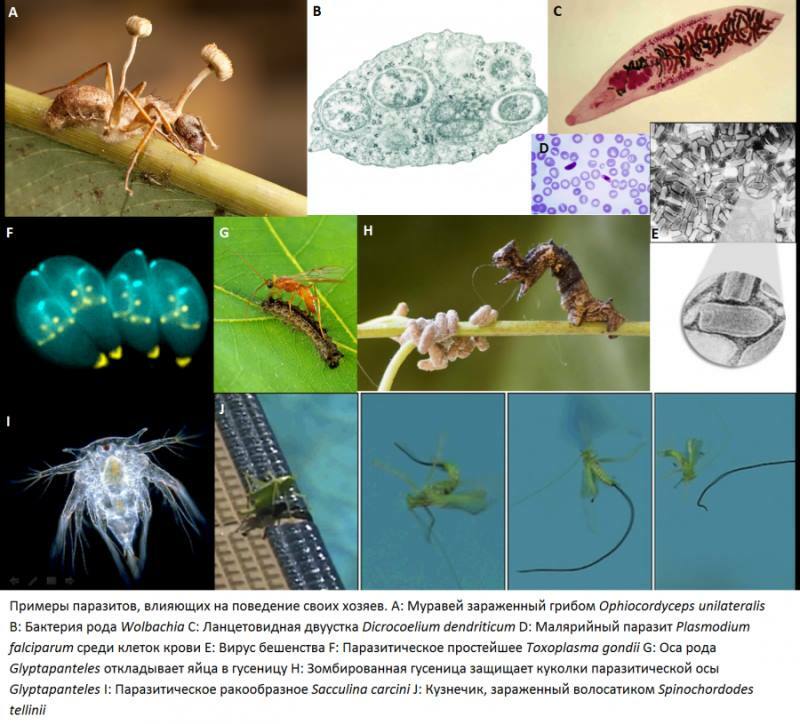 Andersen SB, Gerritsma S, Yusah KM, Mayntz D, Hywel-Jones NL, Billen J, Boomsma JJ, Hughes DP: The life of a dead ant: the expression of an adaptive extended phenotype. Am Nat 2009, 174(3):424-433. 16. Koukou K, Pavlikaki H, Kilias G, Werren JH, Bourtzis K, Alahiotis SN: Influence of antibiotic treatment and Wolbachia curing on sexual isolation among Drosophila melanogaster cage populations. Evolution 2006, 60(1):87-96. 17. Wiwatanaratanabutr I, Allan S, Linthicum K, Kittayapong P: Strain-specific differences in mating, oviposition, and host-seeking behavior between Wolbachia-infected and uninfected Aedes albopictus. J Am Mosq Control Assoc 2010, 26(3):265-273. 18. Zimmer C: Parasite Rex: Inside the Bizarre World of Nature's Most Dangerous Creatures. Free Press 2000. 19. Kristensen T, Nielsen AI, Jørgensen AI, Mouritsen KN, Glenner H, Christensen JT, Lützen J, Høeg JT: The selective advantage of host feminization: a case study of the green crab Carcinus maenas and the parasitic barnacle Sacculina carcini. Marine Biology 2012, 159(9):2015-2023. 20. Wang L, Cao Y, Tang Q, Liang G: Role of the blood-brain barrier in rabies virus infection and protection. Protein Cell 2013, 4(12):901-903. 21. Thiptara A, Atwill ER, Kongkaew W, Chomel BB: Epidemiologic trends of rabies in domestic animals in southern Thailand, 1994-2008. Am J Trop Med Hyg 2011, 85(1):138-145. 22. Manga-Gonzalez MY, Gonzalez-Lanza C, Cabanas E, Campo R: Contributions to and review of dicrocoeliosis, with special reference to the intermediate hosts of Dicrocoelium dendriticum. Parasitology 2001, 123 Suppl:S91-114. 23. Romig T, Lucius R, Frank W: Cerebral larvae in the second intermediate host of Dicrocoelium dendriticum (Rudolphi, 1819) and Dicrocoelium hospes Looss, 1907 (Trematodes, Dicrocoeliidae). Zeitschrift fur Parasitenkunde 1980, 63(3):277-286. 24. Biron DG, Marche L, Ponton F, Loxdale HD, Galeotti N, Renault L, Joly C, Thomas F: Behavioural manipulation in a grasshopper harbouring hairworm: a proteomics approach. Proc Biol Sci 2005, 272(1577):2117-2126. 25. Grosman AH, Janssen A, de Brito EF, Cordeiro EG, Colares F, Fonseca JO, Lima ER, Pallini A, Sabelis MW: Parasitoid increases survival of its pupae by inducing hosts to fight predators. PLoS One 2008, 3(6):e2276. 26. Ingwell LL, Eigenbrode SD, Bosque-Perez NA: Plant viruses alter insect behavior to enhance their spread. Sci Rep 2012, 2:578. 27. Nyasembe VO, Teal PE, Sawa P, Tumlinson JH, Borgemeister C, Torto B: Plasmodium falciparum Infection Increases Anopheles gambiae Attraction to Nectar Sources and Sugar Uptake. Curr Biol 2014. 28. Montoya JG, Liesenfeld O: Toxoplasmosis. Lancet 2004, 363(9425):1965-1976. 29. Pappas G, Roussos N, Falagas ME: Toxoplasmosis snapshots: global status of Toxoplasma gondii seroprevalence and implications for pregnancy and congenital toxoplasmosis. Int J Parasitol 2009, 39(12):1385-1394. 30. Prandota J: Possible Link Between Toxoplasma Gondii and the Anosmia Associated With Neurodegenerative Diseases. Am J Alzheimers Dis Other Demen 2014. 31. Webster JP, McConkey GA: Toxoplasma gondii-altered host behaviour: clues as to mechanism of action. Folia Parasitol (Praha) 2010, 57(2):95-104. 32. Flegr J: Effects of toxoplasma on human behavior. Schizophr Bull 2007, 33(3):757-760. 33. Pedersen MG, Mortensen PB, Norgaard-Pedersen B, Postolache TT: Toxoplasma gondii infection and self-directed violence in mothers. Arch Gen Psychiatry 2012, 69(11):1123-1130. 34. Ling VJ, Lester D, Mortensen PB, Langenberg PW, Postolache TT: Toxoplasma gondii seropositivity and suicide rates in women. J Nerv Ment Dis 2011, 199(7):440-444. 35. Flegr J, Havlicek J, Kodym P, Maly M, Smahel Z: Increased risk of traffic accidents in subjects with latent toxoplasmosis: a retrospective case-control study. BMC Infect Dis 2002, 2:11. 36. Flegr J, Lenochova P, Hodny Z, Vondrova M: Fatal attraction phenomenon in humans: cat odour attractiveness increased for toxoplasma-infected men while decreased for infected women. PLoS Negl Trop Dis 2011, 5(11):e1389. 37. Lafferty KD: Can the common brain parasite, Toxoplasma gondii, influence human culture? Proc Biol Sci 2006, 273(1602):2749-2755. 38. Ingram WM, Goodrich LM, Robey EA, Eisen MB: Mice infected with low-virulence strains of Toxoplasma gondii lose their innate aversion to cat urine, even after extensive parasite clearance. PLoS One 2013, 8(9):e75246. 39. Berdoy M, Webster JP, Macdonald DW: Fatal attraction in rats infected with Toxoplasma gondii. Proc Biol Sci 2000, 267(1452):1591-1594. 40. Poggiolini I, Saverioni D, Parchi P: Prion Protein Misfolding, Strains, and Neurotoxicity: An Update from Studies on Mammalian Prions. Int J Cell Biol 2013, 2013:910314. 41. Prusiner SB, Gajdusek C, Alpers MP: Kuru with incubation periods exceeding two decades. Annals of neurology 1982, 12(1):1-9. 42. Bostanci A: Wildlife biology. A devil of a disease. Science 2005, 307(5712):1035. 43. Mukaratirwa S, Gruys E: Canine transmissible venereal tumour: cytogenetic origin, immunophenotype, and immunobiology. A review. Vet Q 2003, 25(3):101-111. 44. Boyer P: Religion Explained: The Evolutionary Origins of Religious Thought. 2001. 45. Youngster I, Berkovitch M, Kozer E, Lazarovitch Z, Berkovitch S, Goldman M: "Can religious icons be vectors of infectious diseases in hospital settings?". Am J Infect Control 2009, 37(10):861-863. 46. Pellerin J, Edmond MB: Infections associated with religious rituals. Int J Infect Dis 2013, 17(11):e945-948. 47. Haworth E, Barasheed O, Memish ZA, Rashid H, Booy R: Prevention of influenza at Hajj: applications for mass gatherings. J R Soc Med 2013, 106(6):215-223. 48. Shibl A, Tufenkeji H, Khalil M, Memish Z, Meningococcal Leadership Forum Expert G: Consensus recommendation for meningococcal disease prevention for Hajj and Umra pilgrimage/travel medicine. Eastern Mediterranean health journal = La revue de sante de la Mediterranee orientale = al-Majallah al-sihhiyah li-sharq al-mutawassit 2013, 19(4):389-392. 49. Kannathasan S, Murugananthan A, Rajeshkannan N, de Silva NR: Cutaneous larva migrans among devotees of the Nallur temple in Jaffna, Sri Lanka. PLoS One 2012, 7(1):e30516. 50. Kannathasan S, Murugananthan A, Rajeshkannan N, de Silva NR: A simple intervention to prevent cutaneous larva migrans among devotees of the Nallur Temple in Jaffna, Sri Lanka. PLoS One 2013, 8(4):e61816. 51. Kirschner AK, Atteneder M, Schmidhuber A, Knetsch S, Farnleitner AH, Sommer R: Holy springs and holy water: underestimated sources of illness? Journal of water and health 2012, 10(3):349-357. 52. Abraham WR: Megacities as sources for pathogenic bacteria in rivers and their fate downstream. International journal of microbiology 2011, 2011. 53. Hamner S, Tripathi A, Mishra RK, Bouskill N, Broadaway SC, Pyle BH, Ford TE: The role of water use patterns and sewage pollution in incidence of water-borne/enteric diseases along the Ganges river in Varanasi, India. International journal of environmental health research 2006, 16(2):113-132. 54. Dawkins R: The Selfish Gene. Oxford University Press 1989. 55. Bui E, Rodgers R, Chabrol H, Birmes P, Schmitt L: Is Anakin Skywalker suffering from borderline personality disorder? Psychiatry Res 2011, 185(1-2):299. 56. Berenreiterova M, Flegr J, Kubena AA, Nemec P: The distribution of Toxoplasma gondii cysts in the brain of a mouse with latent toxoplasmosis: implications for the behavioral manipulation hypothesis. PLoS One 2011, 6(12):e28925. 57. Dalimi A, Abdoli A: Latent toxoplasmosis and human. Iranian journal of parasitology 2012, 7(1):1-17. 58. Halonen SK, Lyman WD, Chiu FC: Growth and development of Toxoplasma gondii in human neurons and astrocytes. Journal of neuropathology and experimental neurology 1996, 55(11):1150-1156. 59. Carruthers VB, Suzuki Y: Effects of Toxoplasma gondii infection on the brain. Schizophr Bull 2007, 33(3):745-751. 60. Garcia HH, Gonzalez AE, Evans CA, Gilman RH, Cysticercosis Working Group in P: Taenia solium cysticercosis. Lancet 2003, 362(9383):547-556. 61. Moyano LM, Saito M, Montano SM, Gonzalvez G, Olaya S, Ayvar V, Gonzalez I, Larrauri L, Tsang VC, Llanos F et al: Neurocysticercosis as a cause of epilepsy and seizures in two community-based studies in a cysticercosis-endemic region in Peru. PLoS Negl Trop Dis 2014, 8(2):e2692. 62. Devinsky O, Lai G: Spirituality and religion in epilepsy. Epilepsy & behavior : E&B 2008, 12(4):636-643. 63. Abdel Razek AA, Watcharakorn A, Castillo M: Parasitic diseases of the central nervous system. Neuroimaging clinics of North America 2011, 21(4):815-841, viii. 64. Tronvik E, Sorensen T, Linde M, Bendtsen L, Artto V, Laurell K, Kallela M, Zwart JA, Hagen K: The relationship between headache and religious attendance (the Nord-Trondelag health study- HUNT). The journal of headache and pain 2014, 15(1):1. 65. Cohen CI, Henry KA: The prevalence of headache and associated psychosocial factors in an urban biracial sample of older adults. International journal of psychiatry in medicine 2011, 41(4):329-342. 66. Romero JR, Newland JG: Viral meningitis and encephalitis: traditional and emerging viral agents. Seminars in pediatric infectious diseases 2003, 14(2):72-82. 67. Miller F, Afonso PV, Gessain A, Ceccaldi PE: Blood-brain barrier and retroviral infections. Virulence 2012, 3(2):222-229. 68. Steiner I, Benninger F: Update on herpes virus infections of the nervous system. Current neurology and neuroscience reports 2013, 13(12):414. 69. Amlie-Lefond C, Jubelt B: Neurologic manifestations of varicella zoster virus infections. Current neurology and neuroscience reports 2009, 9(6):430-434. 70. Al Masalma M, Lonjon M, Richet H, Dufour H, Roche PH, Drancourt M, Raoult D, Fournier PE: Metagenomic analysis of brain abscesses identifies specific bacterial associations. Clinical infectious diseases : an official publication of the Infectious Diseases Society of America 2012, 54(2):202-210. 71. Fincher CL, Thornhill R: Parasite-stress promotes in-group assortative sociality: the cases of strong family ties and heightened religiosity. Behav Brain Sci 2012, 35(2):61-79. 72. Fredericks DN, Relman DA: Sequence-based identification of microbial pathogens: a reconsideration of Koch's postulates. Clin Microbiol Rev 1996, 9(1):18-33. 73. Okome-Nkoumou M, Guiyedi V, Ondounda M, Efire N, Clevenbergh P, Dibo M, Dzeing-Ella A: Opportunistic Diseases in HIV-Infected Patients in Gabon following the Administration of Highly Active Antiretroviral Therapy: A Retrospective Study. Am J Trop Med Hyg 2013. 74. Fallani M, Young D, Scott J, Norin E, Amarri S, Adam R, Aguilera M, Khanna S, Gil A, Edwards CA et al: Intestinal microbiota of 6-week-old infants across Europe: geographic influence beyond delivery mode, breast-feeding, and antibiotics. J Pediatr Gastroenterol Nutr 2010, 51(1):77-84. 75. Devkota S, Chang EB: Nutrition, microbiomes, and intestinal inflammation. Curr Opin Gastroenterol 2013, 29(6):603-607. 76. Sonoyama K, Fujiwara R, Takemura N, Ogasawara T, Watanabe J, Ito H, Morita T: Response of gut microbiota to fasting and hibernation in Syrian hamsters. Appl Environ Microbiol 2009, 75(20):6451-6456. 77. Costello EK, Gordon JI, Secor SM, Knight R: Postprandial remodeling of the gut microbiota in Burmese pythons. The ISME journal 2010, 4(11):1375-1385. 78. Crawford PA, Crowley JR, Sambandam N, Muegge BD, Costello EK, Hamady M, Knight R, Gordon JI: Regulation of myocardial ketone body metabolism by the gut microbiota during nutrient deprivation. Proc Natl Acad Sci U S A 2009, 106(27):11276-11281. 79. Carey HV, Walters WA, Knight R: Seasonal restructuring of the ground squirrel gut microbiota over the annual hibernation cycle. American journal of physiology Regulatory, integrative and comparative physiology 2013, 304(1):R33-42. 80. Flegr J: How and why Toxoplasma makes us crazy. Trends in parasitology 2013, 29(4):156-163. 81. Henriquez SA, Brett R, Alexander J, Pratt J, Roberts CW: Neuropsychiatric disease and Toxoplasma gondii infection. Neuroimmunomodulation 2009, 16(2):122-133. 82. Wang T, Tang ZH, Li JF, Li XN, Wang X, Zhao ZJ: A potential association between Toxoplasma gondii infection and schizophrenia in mouse models. Experimental parasitology 2013, 135(3):497-502. 83. Siddle R, Haddock G, Tarrier N, Faragher EB: Religious delusions in patients admitted to hospital with schizophrenia. Social psychiatry and psychiatric epidemiology 2002, 37(3):130-138. 84. Mohr S, Borras L, Nolan J, Gillieron C, Brandt PY, Eytan A, Leclerc C, Perroud N, Whetten K, Pieper C et al: Spirituality and religion in outpatients with schizophrenia: a multi-site comparative study of Switzerland, Canada, and the United States. International journal of psychiatry in medicine 2012, 44(1):29-52. 85. Marshall BJ, Warren JR: Unidentified curved bacilli in the stomach of patients with gastritis and peptic ulceration. Lancet 1984, 1(8390):1311-1315. 86. Munz P, Hudea I, Imad J, Smith R: When Zombies Attack! : Mathematical Modelling of an Outbreak of Zombie Infection. Infectious Disease Modelling Research Progress 2009:133-150. 87. Ahammad ZS, Sreekrishnan TR, Hands CL, Knapp CW, Graham DW: Increased waterborne bla resistance gene abundances associated with seasonal human pilgrimages to the Upper Ganges River. Environmental science & technology 2014. 88. Alebie G, Erko B, Aemero M, Petros B: Epidemiological study on Schistosoma mansoni infection in Sanja area, Amhara region, Ethiopia. Parasites & vectors 2014, 7:15. 89. Sow S, Polman K, Vereecken K, Vercruysse J, Gryseels B, de Vlas SJ: The role of hygienic bathing after defecation in the transmission of Schistosoma mansoni. Transactions of the Royal Society of Tropical Medicine and Hygiene 2008, 102(6):542-547. 90. Thornhill R, Fincher CL: Parasite stress promotes homicide and child maltreatment. Philos Trans R Soc Lond B Biol Sci 2011, 366(1583):3466-3477. 91. Murray DR, Schaller M, Suedfeld P: Pathogens and politics: further evidence that parasite prevalence predicts authoritarianism. PLoS One 2013, 8(5):e62275. 92. Tuzhikov A, Panchin A, Shestopalov VI: TUIT, a BLAST-based tool for taxonomic classification of nucleotide sequences. BioTechniques 2014, 56(2):78-84. 93. Wang Q, Garrity GM, Tiedje JM, Cole JR: Naive Bayesian classifier for rapid assignment of rRNA sequences into the new bacterial taxonomy. Appl Environ Microbiol 2007, 73(16):5261-5267. 94. Huson DH, Mitra S, Ruscheweyh HJ, Weber N, Schuster SC: Integrative analysis of environmental sequences using MEGAN4. Genome Res 2011, 21(9):1552-1560.